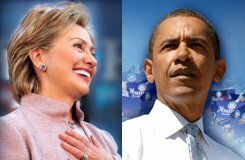 AmpleAliveness™: Hillary or Barak: Who's most fat-friendly (or least fat-hating)? This is so cool! My blog partner wrote an article about McCain VS Obama. We did not agree. I said Obama and the Dems but he made a pretty convincing argument that McCain was the most Fat Friendly candidate.